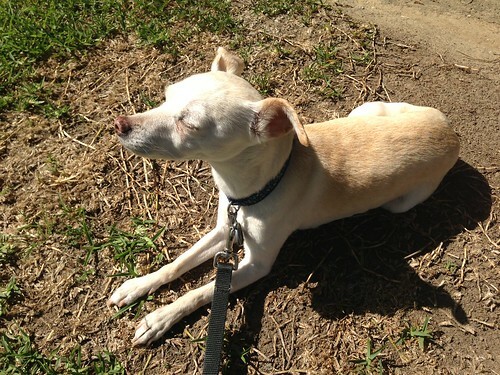 PIC: Jackie Brown enjoying sunny Southern California sun! Was a perfect 72 degrees out! PIC: Jackie Brown enjoying sunny Southern California sun! Was a perfect 72 degrees out!, originally uploaded by @jozjozjoz. I took her for a little walk in the middle of the day and I got annoyed because she was just goofing off in the sun. "Laying down is not taking a walk, Jackie!" I kept saying. Clearly, she did not care. I was probably just grumpy because I was standing in the hot sun, but her cuteness makes up for it all! The jozjozjoz.com archives for Monday, February 24th, 2014.